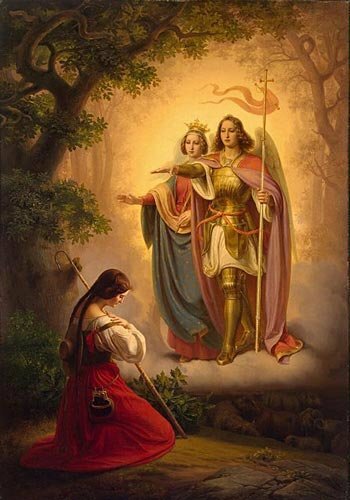 Throughout her short life, Saint Joan of Arc received counsel and was protected and guided by four voices: the Archangel Michael, the Archangel Gabriel, Saint Catherine of Alexander, and Saint Margaret, sometimes referred to as Marina. The female saints guided her loyally through the next four years of her childhood, instructing her on proper ways to live her life and govern her behavior to the glory of God. They primed her, instilling virtues she needed for a greater mission which lay before her, which she understandably did not fully comprehend at the time. When Joan turned seventeen, the voices in the head changed tone and direction. The bluntness and direct speech of Michael replaced the gentle comforters represented by Catherine and Margaret. During their frequent “talks” Michael laid out a specific plan, the centerpiece of which consisted of the young girl liberating her country. Joan struggled to make sense of what Michael was instructing her to do: “And I answered the Voice that I was a poor girl who knew nothing of riding and warfare.” Her response is hauntingly like that of the Virgin Mary’s when Gabriel told her she was to mother the Son of God: “How can this be, as I know not a man.” Like Mary, Joan eventually came to the understanding that God was commanding her to go, and that she was compelled to obey. And since God Himself had communicated His will through the Archangels Michael and Gabriel, Joan knew that she must obey, regardless of the implication — her violent death. Saint Michael, Saint Catherine and Saint Margaret won her devotion and her confidence. Young Joan put her complete faith in the voices she heard, and she constantly and consistently moved in the direction in which they led her. These were her personal, “guardian” angels who were providing counsel, forewarning her of danger, personal injury and eventually her own capture and tragic death. These three guardians became Joan’s patron saints. She shared many similarities with Saint Catherine, and Saint Margaret’s statue in Joan’s hometown chapel in Domremy served as an ever-present visual reminder to the young girl. In Domremy Joan prayed consistently before the statue of Saint Margaret, which still stands to this day. Like Joan of Arc, both female saints before her were similarly persecuted for refusing to deny their faith and were virgin martyrs. Although Joan denied her faith when brought before the stake and threatened with being burned alive, she later recanted, citing that she had denied her faith at first because of her primal fear of fire. 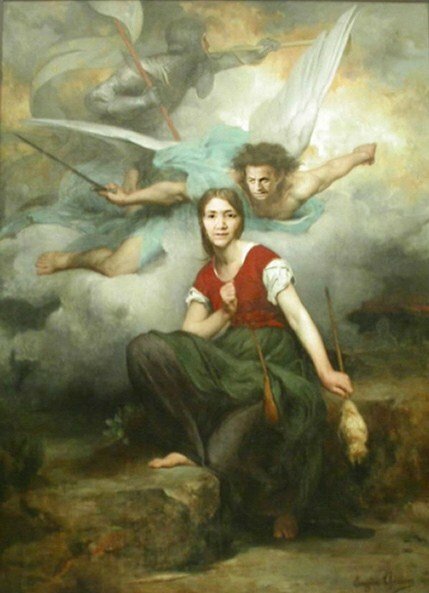 Joan’s connection to Saint Michael is just as obvious. Saint Michael was the patron saint of the royal house of France during Joan’s life, so she naturally was familiar with him and held an affinity for him as her country’s protector. Joan certainly would have known this. 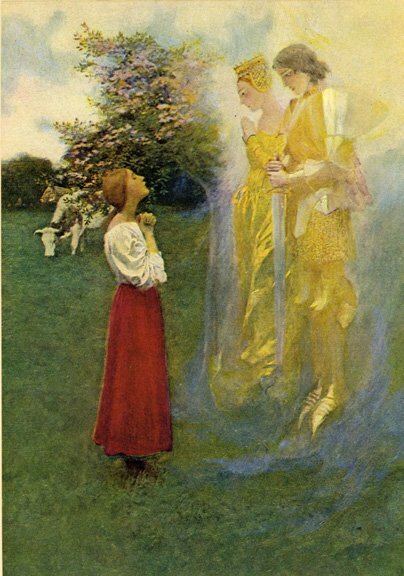 Stories about him, which Joan would have heard, figure him predominantly as champion and leader of faithful angels in their struggle against evil. Michael commanded Joan to go to the aid of France and later appeared to her as a war counselor. Saint Michael is typically depicted in armor with wings outstretched and sword or lance drawn, ready to pierce the serpent being restrained under foot. In many medieval paintings, he bears a shield with a red cross that represents “truth”. Michael is the champion of woman, specifically protecting the Mother Mary and her offspring. He is referred to as the prince of angels and is first in the nine angelic orders. His presence was first documented in the time of the Old Testament where he was known for interceding for the human race. There are two feast days honoring Saint Michael: September 29, which honors the dedication of theChurchofSt. MichaelinRomeduring the sixth century, and May 8, which commemorates the day of his apparition in Italy. Interestingly, on May 8, 1429, after only three days of her first battle, Joan of Arc realized her first military victory by liberating the city of Orleans from a successful seven month siege by the English. 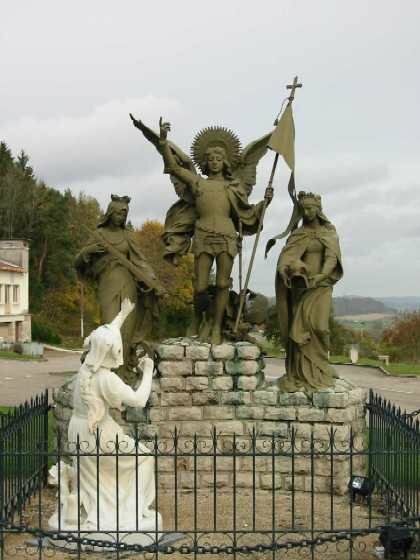 Saint Michael’s intercession would continue as her military campaign progressed. Great Info. She is my Patron Saint. 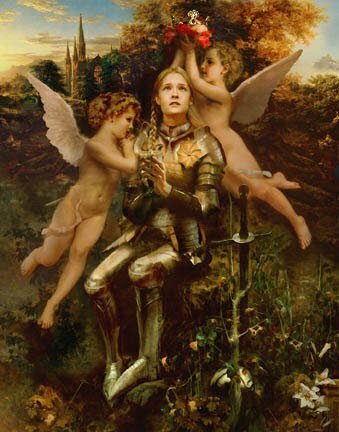 Today I found out that the female warrior Joan of Arc is a saint. 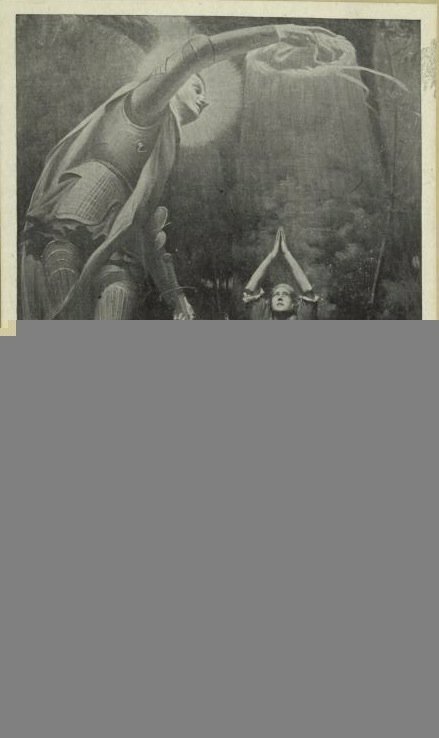 I will also pray to Saint Joan her for strength and faith in my life.